Supplementary material reads: "Chernus -- Long Beach. Berling trial. Three negs. show Violet John Berling in courtroom, Long Beach, dabbing eyes and wearing dark glasses. 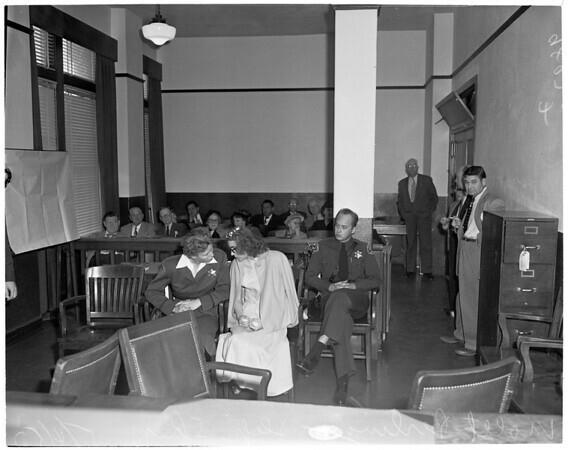 One shows courtroom scene. Violet Berling, wearing glasses, talks to woman deputy sheriff. In next to last row, three seats from right, wearing glasses is the mystery man Mike Verdugo. One neg. shows shot of Mike Verdugo just as he is about to enter elevator."